Members participating this weekend were Tony, Ted, Connie, Harold, Laurie, Lance, Jim, and George, who arrived first. Upon seeing no one, he goes into Urbana looking around. Tony shows up and drives to the farthest camping spot, which you have to drive across a stream and through the campground to reach. With his (Tony’s) truck out of sight George comes back thinking no one again is here. Ted and Connie arrive and we all finally hook up. Close to dark Harold and Laurie come in like normal. With them driving 4 hours after working all day we’re just glad to see them. At the Birch Bark Canoe livery where we are camping, you must park your vehicles in the parking lot about 100yds from the campsite. Once our gear was unloaded we were told to move the trucks. George explained that he sleeps in his truck due to his age and health. Roger from the livery told him to sleep in the parking lot. George got in his truck and drove away. I thought he went to the parking lot. An hour later I went looking for him and there wasn’t a George to be found. He went home, a 4-hour drive. We love you George. One of our newest members, Sir Lance Dumps A Lot, (but not on this trip) also arrived after dark, and we all sat around the campfire relaxing and catching up on each others lives since our last outing together. We had some loud and possibly drunk neighbors that were happy well into the night. Is it rude to wake them early? The thought crossed our minds. 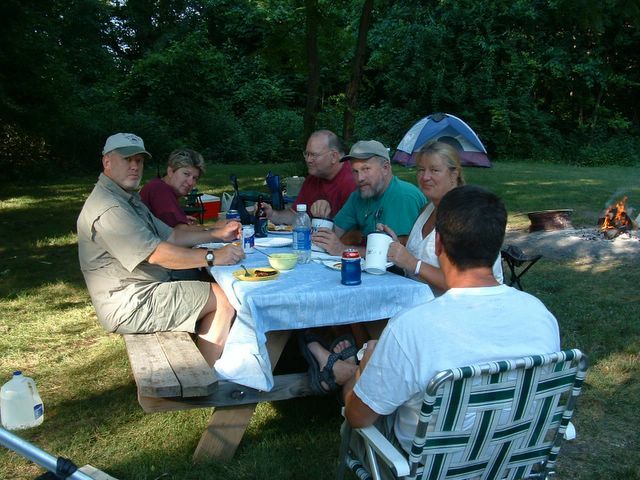 Also our campsite was previously occupied by some major partiers over the July 4th weekend. There was trash everywhere. A young man, 15, that helps around the livery picked some of the trash up but not enough. The resident raccoon(s) had lots of fun dumpster diving. Up around 7:00a.m on Saturday and doing the morning routine. Lance drove into town and reported back that he thought he saw Jim Wolf’s truck with a yellow canoe on it. Sure enough Jim was setting up camp, in another part of the campground cause he didn’t see us way back here in the boonies. We shuttled some vehicles downstream to the St Rt 36 access point for our take out. Then drove North to Pimtown Rd, which is just outside the town of West Liberty. A nice clean town and for those of you who care, it is a dry town. We were on the water at 10:15a.m and floating down the shallow, clear river. Being spring fed the water is almost always clear and cold. 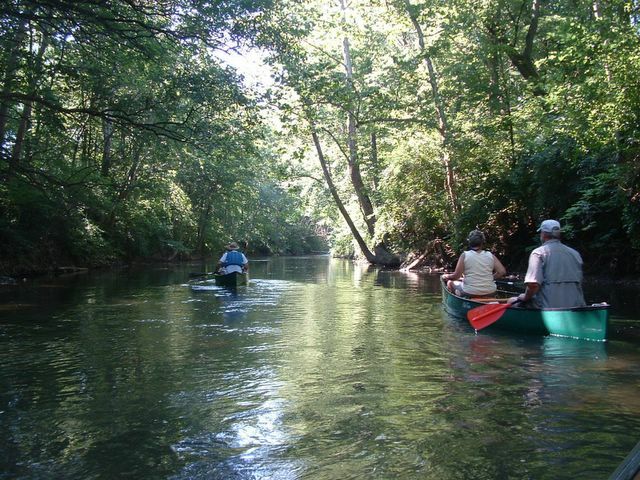 That’s why it’s one of only 3 trout streams in Ohio. The solo canoeists did ok but the tandems had to step out over some ripples five or six times for around 5 miles until feeder streams upped the water level some. Oh the advantages of being solo and lighter. With a couple more inches of water you could just fly down this stream. 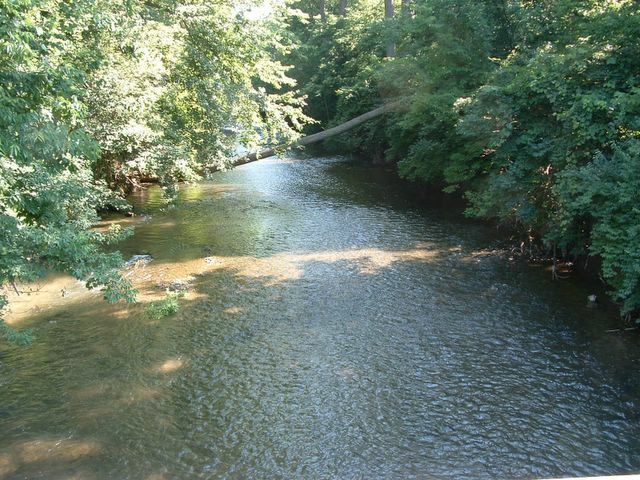 About four miles downstream we came to Lippincott Rd. There our solitude ended. Birch Bark starts a five-mile canoe trip at that spot and with the beautiful clear, warm, sunny day, there were lots of rental canoes on the water. There were kids, college students, mothers and grandmothers. We stopped for lunch where the cement tractor crossing is and watched everyone run the big rapid. A couple capsized but it looked like on purpose. Most of the college kids were drinking, laughing and generally having a great time. When we got close to the St Rt 29 and 296 intersection, there was a sign announcing a boat inspection ahead. 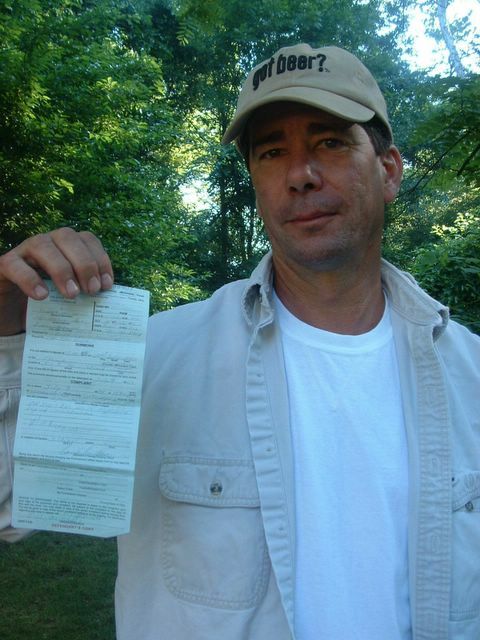 The DNR had five or six rangers pulling people over. Open containers=$150.00 fine. Tony was pulled in and they checked for a life jacket and current registration. The young ranger asked to see in his closed bucket. When Tony asked him what his probable cause was, the ranger looked dazed. He then asked an older ranger if they had anything else for him (Tony). The older ranger said to get the rental number. When Tony said it’s not a rental we are a club they said to go on. Lance, Harold and Laurie, Ted and Connie were also sent on. We never saw Jim again until after reaching the take out. Unfortunately his tags were expired. A $150.00 fine. Let that be a lesson to all you boys and girls out there. Pay your $5.00 yearly license fee and put the remaining $145.00 into new equipment!! A total of 14 people at that time received $150.00 tickets. I bet those rangers had one hell of a party that night. Our trip covered 11 miles and on the river it was nice and cool. After loading up the canoes for the return trip back to camp we were already sweating in the hot sun. After waiting for Jim to finally catch up to us, back to camp we went. 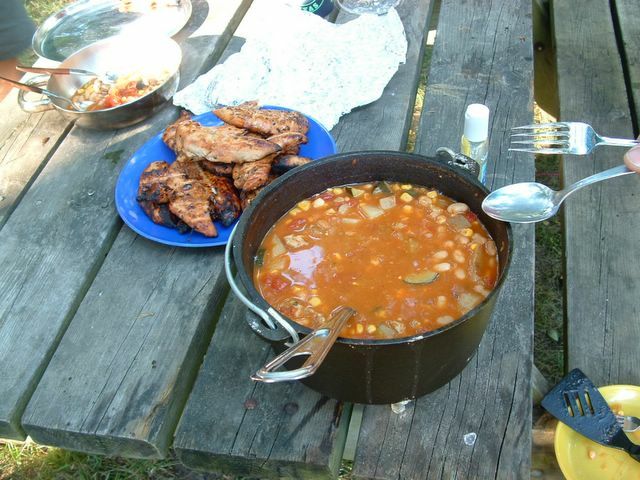 The potluck around 6:00p.m consisted of chicken breast, polish sausage, spicy bean soup cooked in a Dutch oven. Blackberry pie, coleslaw, macaroni, biscuits, etc. After stuffing our bellies, Lance, Harold, Laurie, and Tony scouted the next days take out. At one bridge crossing, Lance went to relieve himself. All of a sudden this black and gray dog comes running out of the woods, very happy to see him and runs thru his stream of urine. The dog then runs to Laurie who starts petting him. Then Lance yells, "don’t touch the dog", too late. 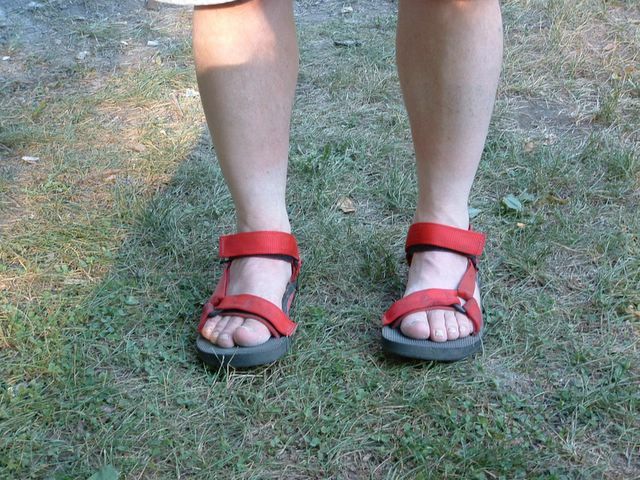 Tony was wearing red Teva sandals that Paul W. gave him on the Michigan trip!!! Everyone made fun of him and Jim was thinking this was a San Francisco type canoe trip. But hey, Ted uses a red paddle. So what! Around dark we all played-left-right-center. It's a dice game that you use three quarters each to try and win everyone else’s money. Poor Lance and Connie, don’t go to Las Vegas!! Up around 7:00a.m and everyone had his or her breakfast. Tony cooked a sausage patty and egg on the Dutch oven lid for the second day in a row. Ted thinks Tony likes to cook, but he really likes to eat instead. Packed everything up and shuttled vehicles downstream. Jim brought everyone back upstream, as he wasn’t canoeing today. Kind of lost his taste for it after yesterday. Thanks for the ride Jim. After buying tee shirts from Birch Bark we launched the canoes around 10:30a.m. Had a nice fast paddle, 7.5 miles in two hours and 14 minutes to Countyline Rd and the end of another OHCRA outing. We saw three mink today for a total of six for both days. Having that many mink tells something about the quality of the water. Also saw lots of fly fisherman. 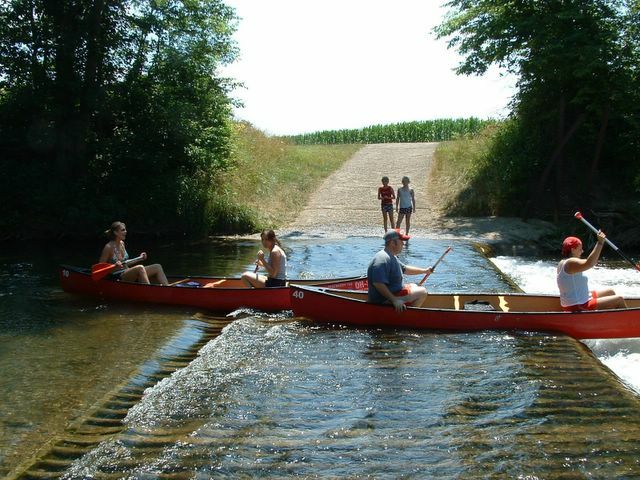 The Mad River is a popular place to visit especially on the weekends. After Labor Day it slows down a lot. Loaded the trucks and said goodbye until next month and the Little Miami trip.